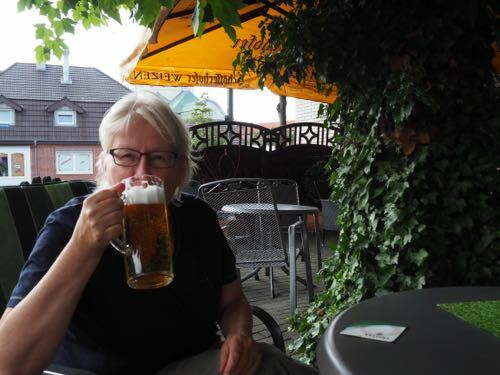 In June 2014 Sylvia attended a Ravelry workshop in Burgdorf near Hannover. 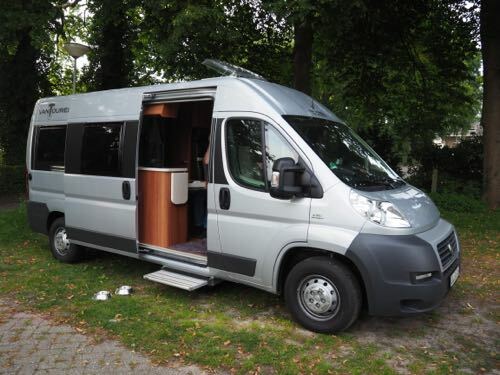 We used the trip at the same time as maiden trip for Little One, our new, small camper van. 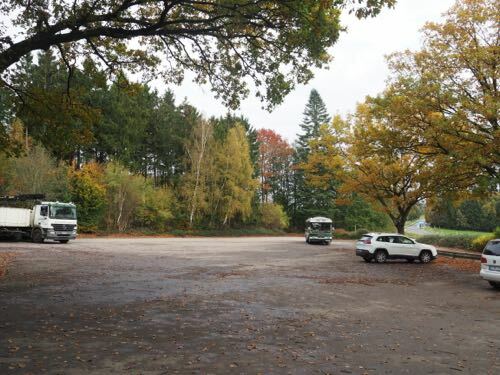 Here we are parked in Nienhagen. Little One fits in a normal parking space, just as it should! 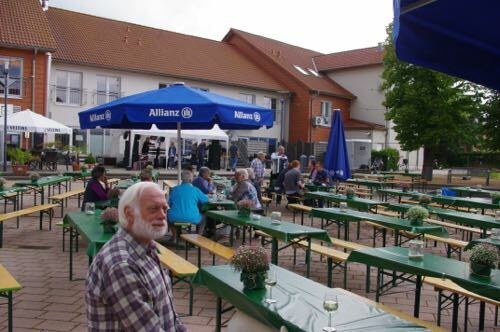 In Nienhagen is the annual wine festival. Because of the rain there aren't many people. But between the showers we can taste some very nice wines. We take home a box of the one we like best. 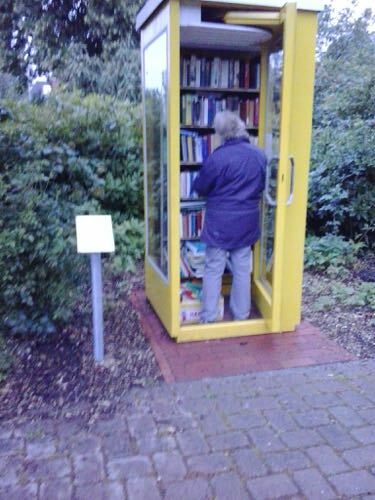 This old telephone booth is converted to a public library. You are asked to leave a book when you take one. Completely free. 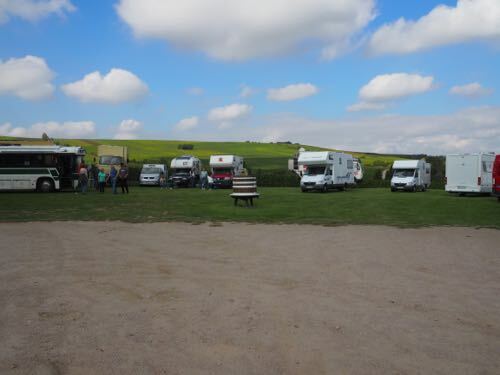 An initiative of the local municipality. 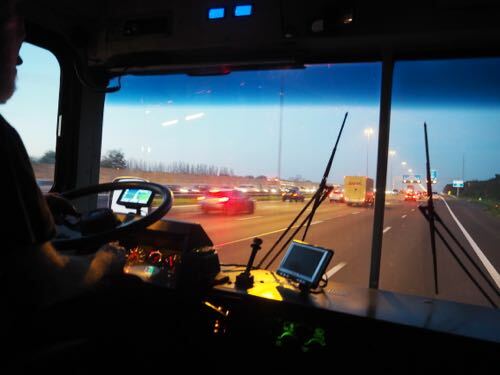 In Little One Motek doesn't have as much space as in Skoolie. Still he acquiesces in his fate. As long as he is with us, he is happy. 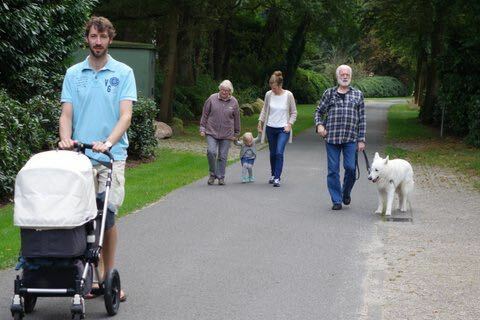 Daughter Judith and son-in-law Marcel spend a week with their kids in the northern Dutch province of Drenthe. 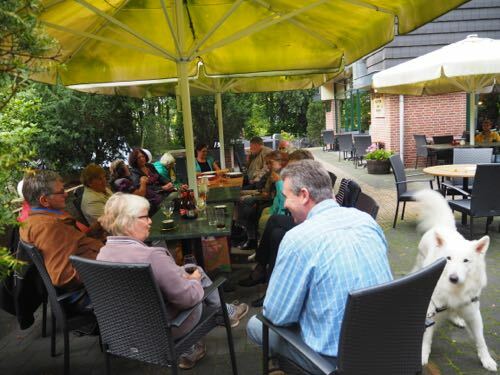 We meet them at the farm-style pancake restaurant Oud-Aalden. The farm house goes back to 1668. After lunch we make a walk through the picturesque village. 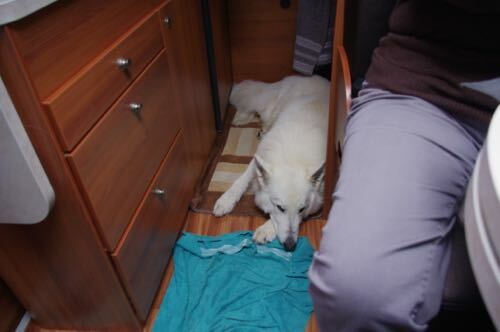 Motek behaves so well that Sara almost completely loses her anxiety. From Drenthe we drive back to Germany. 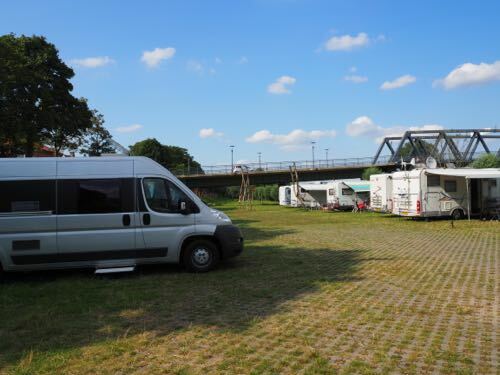 Here we park in Haren on the river Ems. In Haren they serve a very nice beer! 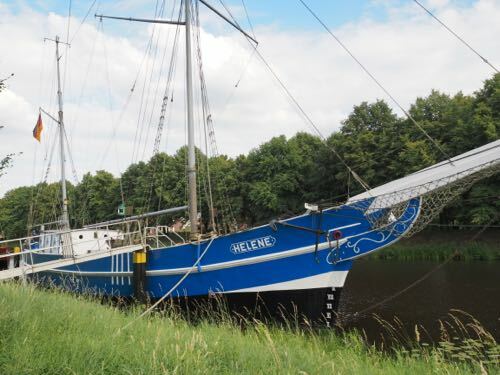 There also is a well-known maritime museum. The floating objects are in a narrow side-channel of the Ems. Over the last few months we have purchased for Little One two new chairs, a new table, new service, even new cutlery. Only Motek's bowls are his regular travel set. Across the border again. 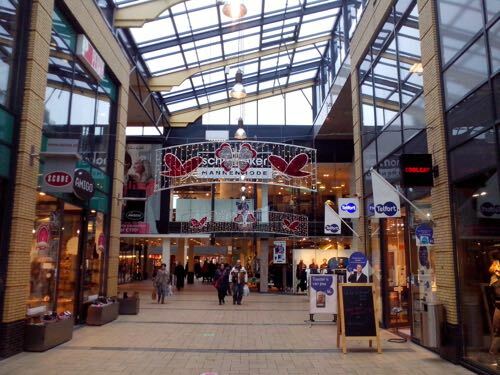 Here we are in Emmen where we do some shopping. In particular food stuff which is not available where we live. 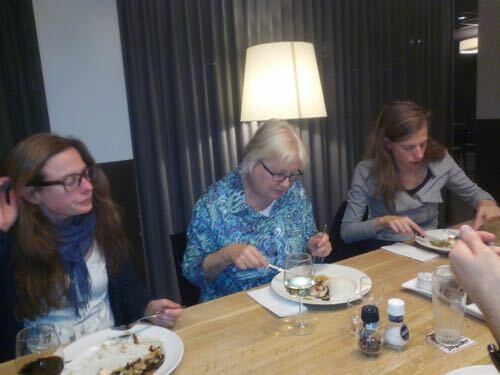 In Utrecht is the annual meeting of long-term members of the Mensa association. Although the serving staff are terribly unfriendly, the atmosphere is still fine. We see each other every year around this date. 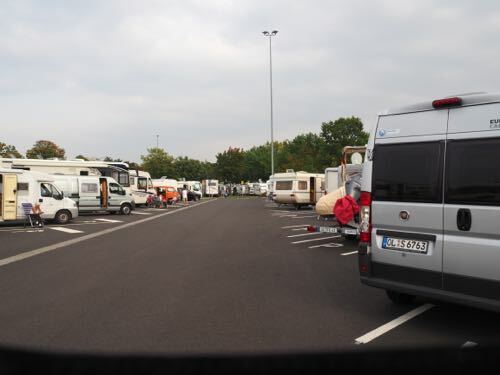 In the beginning of September we take Little One to the annual Düsseldorf Caravansalon, the biggest RV exhibition of Europe. 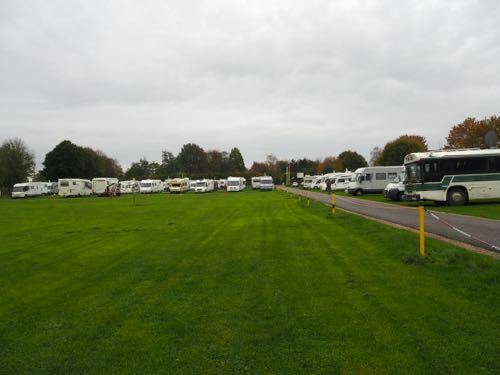 The parking site is one huge camping, about 2000 vehicles. For all those campers you need some entertainment as well. This picture was taken in the afternoon, before the evening programme begins. 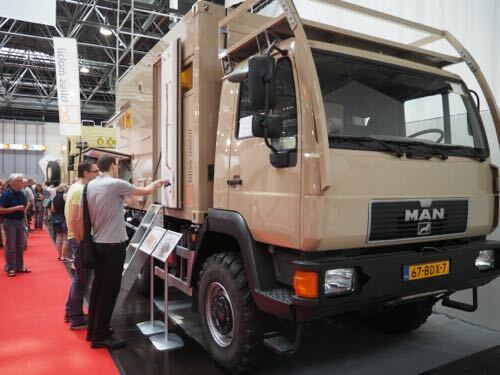 This (Dutch) expedition vehicle is one of the more impressive ones. 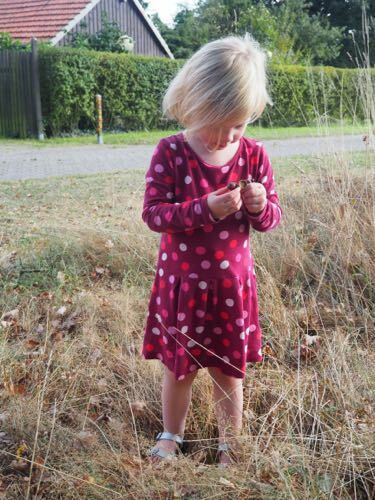 On September 13, we're home to celebrate Sylvia's birthday, together with a few close relatives. Sara never has seen that many acorns at once. 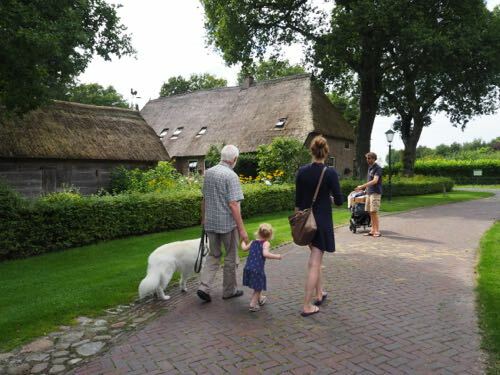 The weather allows a nice walk through our village. 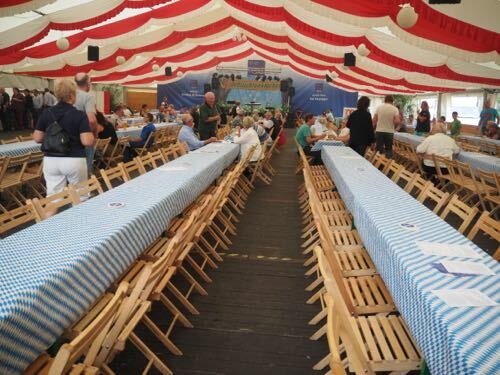 Second half of September we're going to Bodenheim to celebrate Wolfgang's 50th birthday. 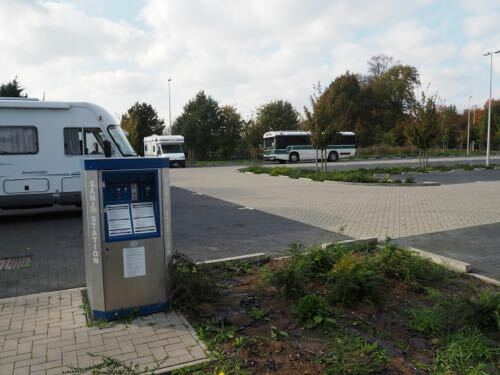 The first day we sleep at Telgte (North Rhine-Westphalia). 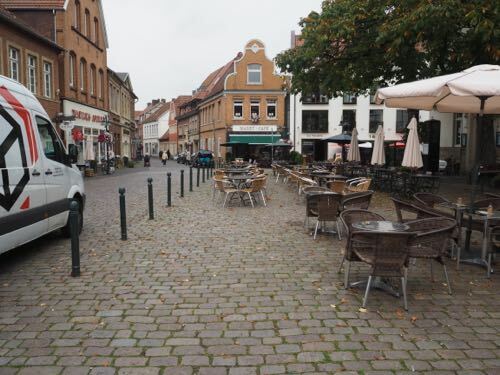 Here is the market square, deserted because of the rain. 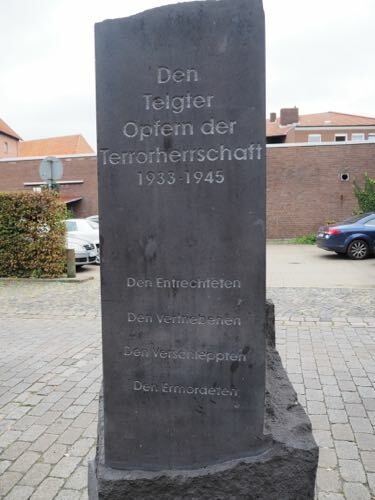 Here, too, is a monument in memory of the victims of the National Socialist prosecution. 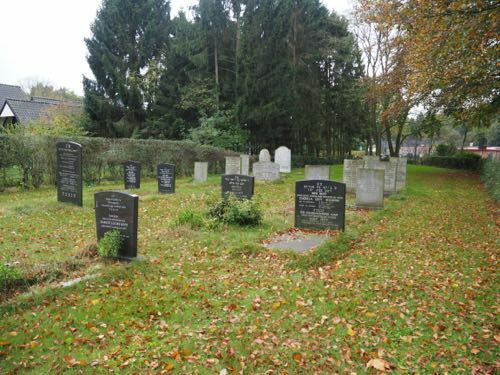 Most headstones of this Jewish cemetery were used for construction purposes during the war. 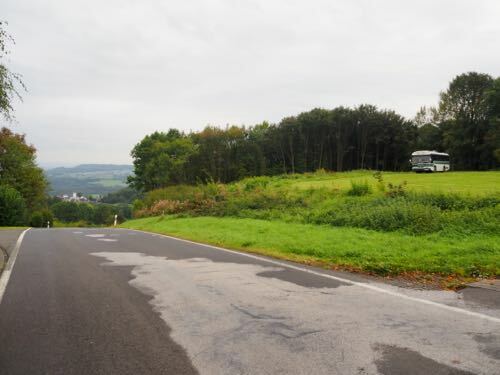 In Winnen (Rhineland-Palatinate) we enjoy a fantastic view on the Taunus mountain range from our bus. 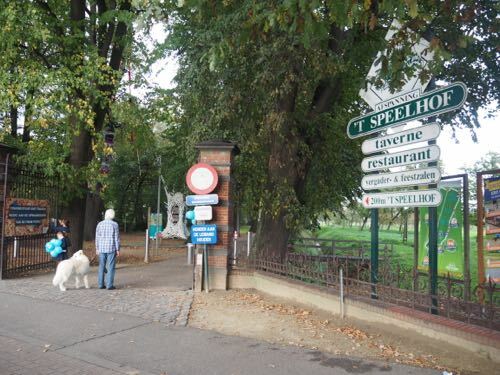 We walk to Winner Kuckuck and have a great German-Arabic meal. 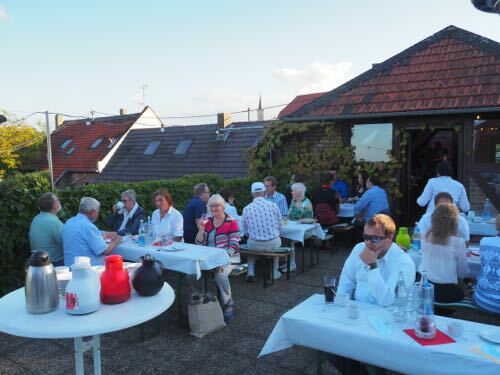 In Bodenheim, our regular destination for the first week of May, we meet some old friends who have also arrived for Wolfgang's birthday party. 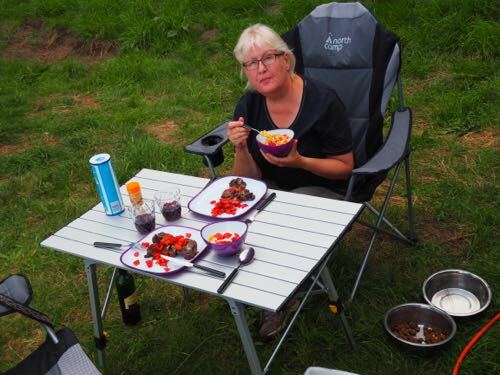 Good weather, good wine, good company.... One doesn't need anything more! Hemer in the Märkischer Kreis (District), in North Rhine-Westphalia, at the north end of the Sauerland near the Ruhr river. A night in the swamp at Hörstel, on our way to Rhede. In Rhede we meet our "old" Mercedes-friend René and his wife Linda. 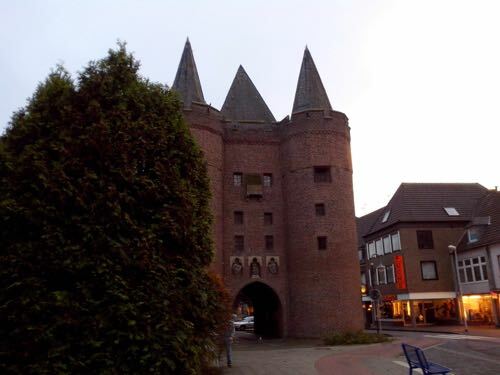 Rhede is in the district of Borken in the state of North Rhine-Westphalia. 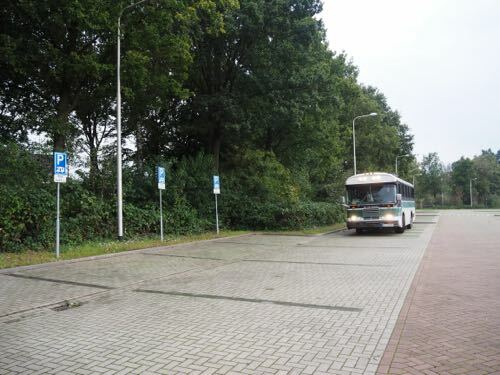 It is located near the border with the Netherlands, approx. 5 km east of Bocholt. Within walking distance is the cozy town centre. They even offer drinking water for Motek. And just outside the centre is this well-kept castle. 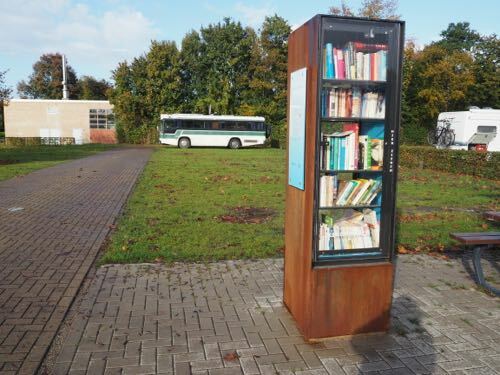 At the motorhome parking in Rees we also find a book exchange cabinet. This one is sponsored by the power company. Our friends Simon and Els live in Rees. 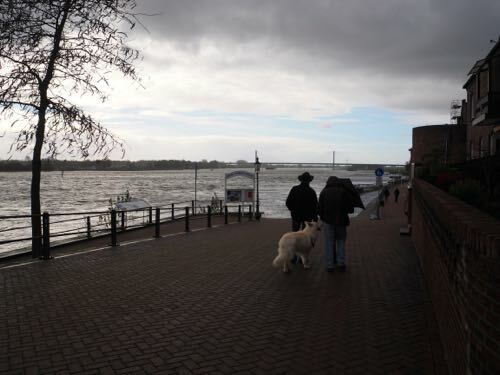 With them we make a walk along the Rhine river in rather threatening weather. 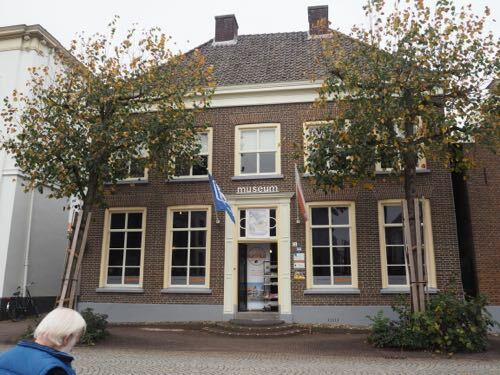 The local museum has a permanent exhibition about villagers who survived the war in hiding. Unfortunately the staff were so unfriendly that after Sylvia's visit, I don't feel like going in as well. 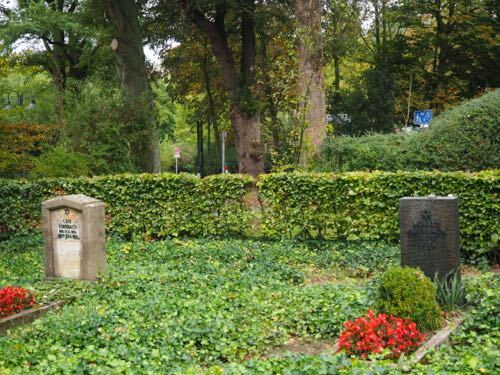 This Jewish cemetery in Terborg looks a lot better that the one in Telgte (above). 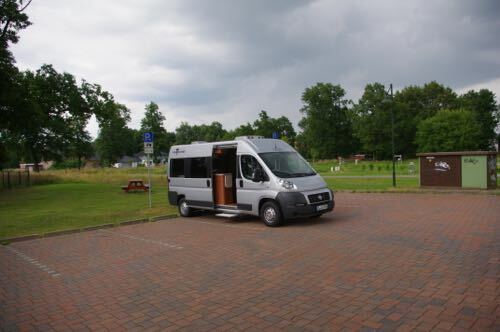 Back in Germany we find a place for the night on this immense place in Goch, district of Kleve, in North Rhine-Westphalia. At night we walk into the inner city to have dinner at the Adria Grill. For Ernst this is pure nostalgia. When he had Summer camps with his gliding club on the nearby Asperden airfield in the '70s, he would go to the same place, especially to enjoy their Yugoslav tomato salad. 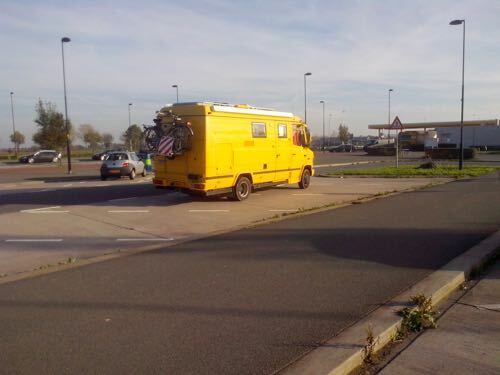 When we stop for lunch (and a little walk for Motek) we see this bright yellow camper van. 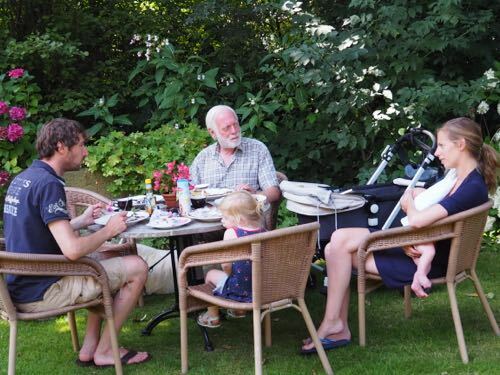 We immediately recognise Henk and Gerda, whom we know about 15 years and whom we meet once every five years. 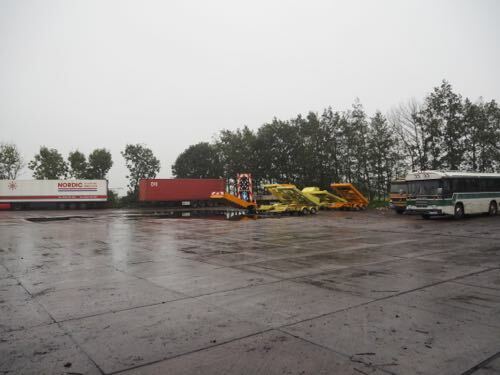 A very wet truck stop at De Meern. Wet, but at least covered with concrete slabs, so not too muddy. We celebrate the daughters' birthdays with a dinner. For them it's only 20 minutes to drive home. 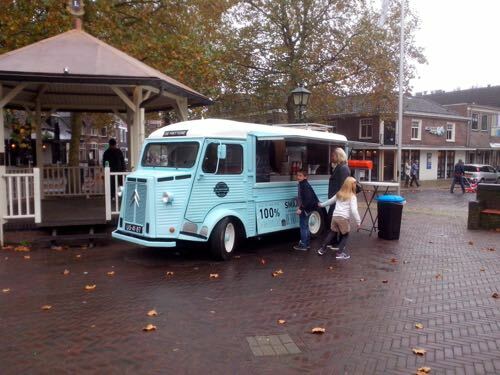 With Skoolie we'd never be able to reach them in the inner city of Utrecht. 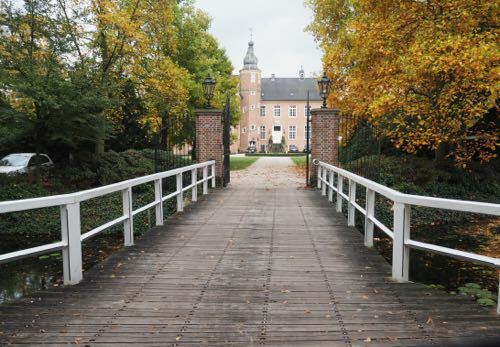 Next we drive to Houten, where Ernst meets with college classmates from his CIBIT/Middlesex education. 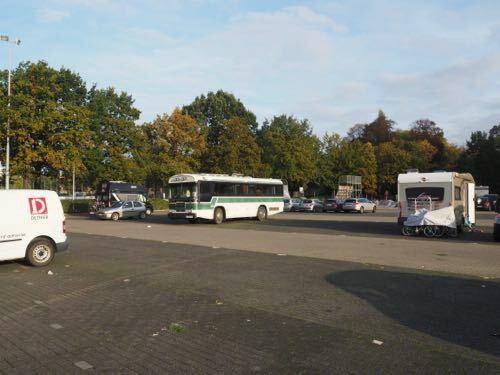 We park outside the centre. On the picture is the cozy town centre with a nostalgic chip shop. The next day we go North to the Emmen mall to pick up a new pair of glasses. In the village of Hürtgenwald (Eifel Mountains) a heavy fight between the American and German armies took place in 1944. 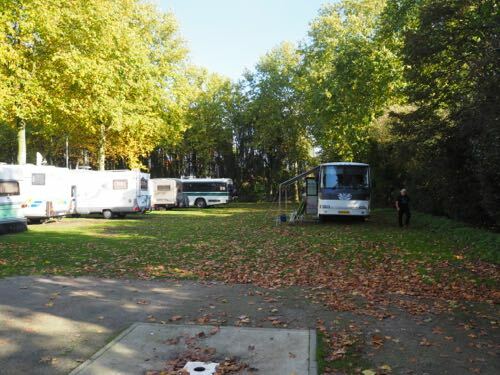 Next to the war cemetery is a large parking with enough space for at leat a dozen motorhomes. 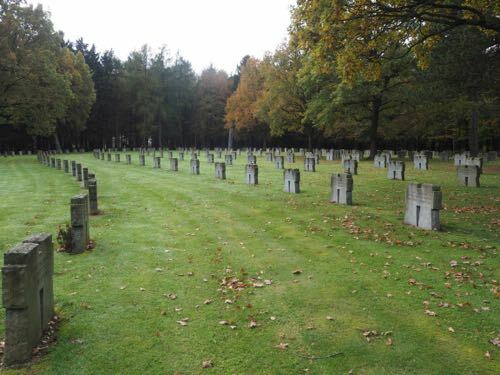 The gritty war cemetery once again makes clear the horrors of war. From the Eifel region to Belgian Flanders is not that far. 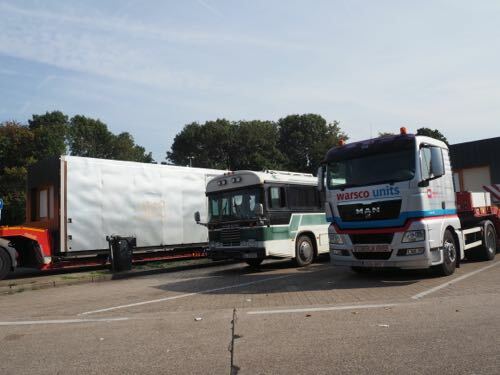 Here we are in Sint-Truiden. Nice park, with several bars and restaurants and even an fenced area where dogs can play off the leash. 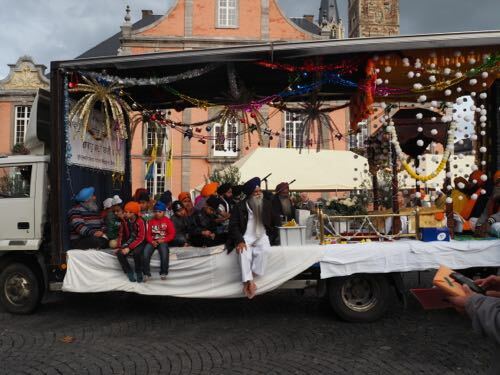 On the market square we run into something special: the Sikh community celebrates Guru Nanak with a very colourful procession. 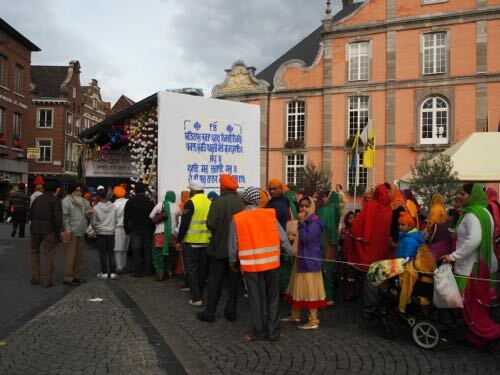 We never realised there were that many Sikhs in Belgium (or even in Europe). 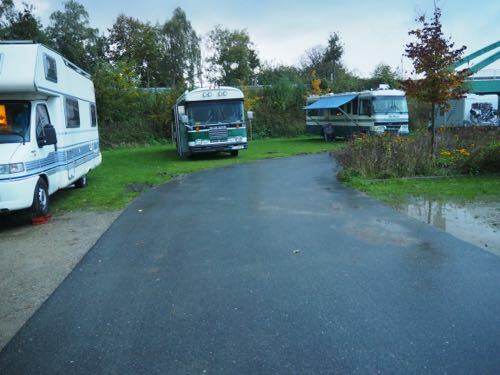 Next to the fire brigade depot in the Flemish town of Grobbendonk is a dedicated motorhome place. Whether we like it or not, a woman from a neighbouring vehicle, tells us everything that's happened to her in the last 50 years. No escape possible. We must redouble our efforts to understand her juicy Flemish. 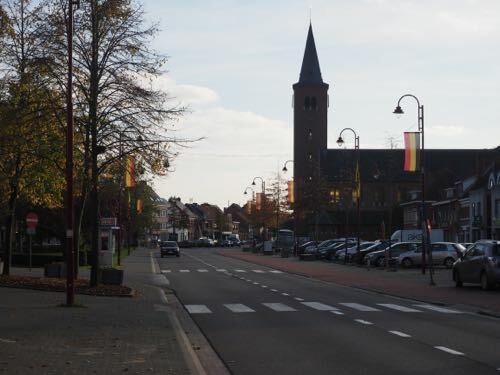 The main street of Grobbendonk, named after the late King Baudouin. Then, after a two weeks trip, it's time to drive home again. 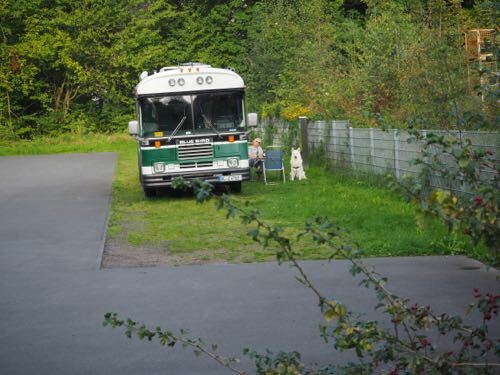 As from November 1st Skoolie should be in its shed until April 1st (no joke). This makes for a massive discount on the road tax.